Isn’t actually a road at all, at least in the direction from which we are approaching. Initially it is a wide expanse of white snow, a veritable palette of potential paths. It is at times a knife edged rocky moraine, dotted with large cairns. In other places, a sheep trail side hilling through tussocks or a snow filled avalanche gully. At other times it takes the look of a steep snow covered birch glade or moist meadows with rock walls. The road to Martoli though, is as much a mental path as a physical one. The students are fixated on Martoli, or at least some of them are. In the spirit of Robert Hasting’s “The Station,” when they get to Martoli there will be flowers blooming (maybe true enough), chai shops serving up the hot brew (seems unlikely) and an English pub next to a Circuit City (nope). Yesterday we made it our goal to get to Martoli. We had been camped somewhere east of Karabasya, below a lateral moraine along the snout of the Shalang Glacier. Easy travel upon the frozen crust of the snow gave way to a bit more intricate route finding through a few gullies. 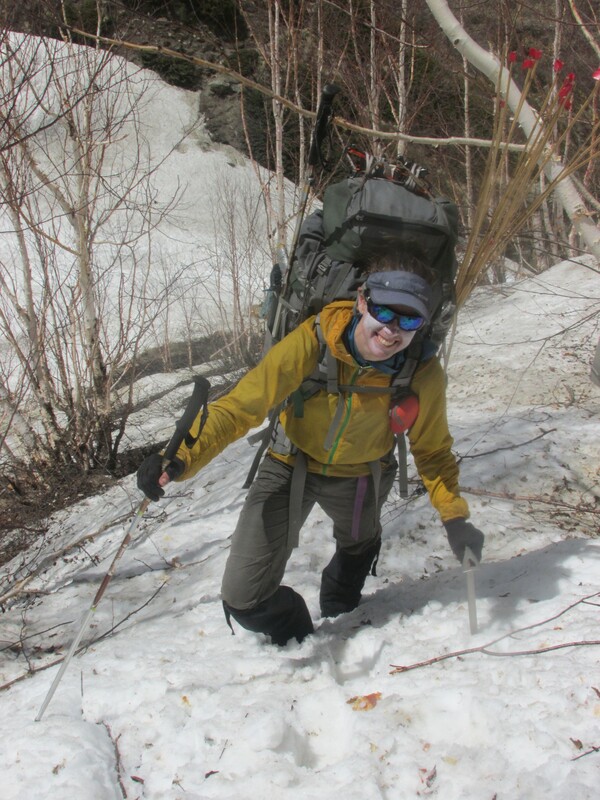 Heavy packs, the stop and go nature of route finding in new terrain plus the decision making process of student leaders all led to slow progress down valley and tired NOLS students. Around 1730, a klick or so short of Martoli, the leaders decided to set up camp and push on tomorrow. Jesse climbing through the birch covered slopes en route to Martoli. To me Martoli is just another dot on the map. It is one more village, kilometer, day closer to going home. It is one step further from the Abode of Snow, the roof of the world, that to me, is a NOLS course. The cultural interactions that will exist down the road from of Martoli are what will, and have, helped set this NOLS course apart from others I have worked. Snowy glaciers and mountains are similar throughout the world. The approach and deproaches and cultural content are what make this course different. None the less, Martoli is one step closer to my days in Lander and being back in the western hemisphere. As we walk out to Martoli it is easy to see more grumbling and less active following. The traverse is in the bag, we are not going back, and the barn smelling has begun. Martoli does not have all the answers. It might not even have the supplies to replenish our limp and saggy foodbags or the porters to take our ropes, boots and trash. We will likely need to schlep our stuff significantly further down the old Silk Road before acquiring those luxuries. Martoli’s life and vibrancy has diminished greatly since the closing of the trade route with Tibet. Many of its former inhabitants have moved south to Munsyari and other more accessible towns and cities and we will work harder because of it. Since the 18,300 foot Dhana Dura pass, the talk has been of Martoli. It has been a long time coming. In addition to its altitude the pass served up a side fare of full conditions and difficult scrambling. The descent from Camp Four to the Shalang Glacier offered steep terrain, soft snow with postholes, travel under threatening hanging glaciers, rappels and loose rock. Our first day off the glacier was soft toss; easy travel, easy camping and a short day. One of the only gimmes on the course. The ten hour day that followed it though was more typical of our progress. In many ways Madhu was right: the hard work started after the pass, the mental tenacity needed to stay focused, stay sharp, pay attention and not smell the nonexistent chai shops of Martoli is much more difficult than the slow, ambling work of climbing to the pass. Now, sitting in a small cramps rock vestibule in the yard of a boarded up “Hotel,” the stark realities of Martoli have hit home. This once vibrant community of 200 plus people is nothing but a ghost town, a B movie set ready for a script, some actors and a little attention. We entered Martoli from above. Below us the smokeless houses, silent streets and drab colors tells us what we need to know. The narrow, empty rock “streets” winding through deserted and collapsed buildings are a scene from a Cormac McCarthy novel. There is nothing. There is hardly even hope. But we walk in anyway. And, in the end the “road” to Martoli appropriately enough, deposits us at the place with the most hope, the town’s abandoned, tattered and worn temple.